The Kraft Heinz Co. and Oprah Winfrey’s joint partnership, Mealtime Stories LLC, has launched a line of retail comfort food products. O, That’s Good! is the pair’s inaugural offering and consists of four soups and four sides at price points of $4.99 and $4.49, respectively. Kraft Heinz believes that when the cold-storage items launch in October they will capitalize on a climbing subsector of the market. “Refrigerated products are on the rise, and we saw an opportunity to drive excitement in this section of the store with convenient soups and sides made with real ingredients and easy preparation,” said Nina Barton, senior vice president of marketing, innovation and research & development for the U.S. business at Kraft Heinz. Oprah expressed equal excitement about the venture. The partnership pairs a company with a long history of success in the food and retail sectors with a star who made her name in a very different industry. Kate Murphy, director of strategic partnerships at the social marketing platform Crowdtap, weighed in on the strategy. Murphy cautioned that a level of authenticity is important, regardless of a given celebrity’s spotlight. “If the partnership feels inauthentic or out of place, that trust is lost and it reflects poorly on both the brand and the individual,” Murphy said. In this case, she feels that Kraft Heinz succeeded in meeting those benchmarks, especially in light of Oprah’s past work in the weight loss and nutrition field. Dr. Ioannis Kareklas, professor of marketing at the University at Albany, concurs with Murphy’s analysis. 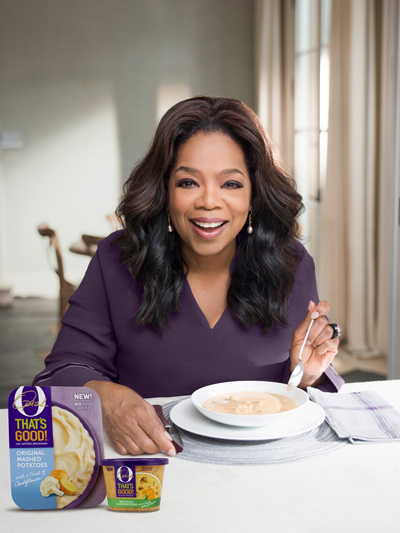 "Though Oprah is not a known expert in the area of healthy foods, she will nonetheless undoubtedly be a valuable spokesperson and endorser for this new brand,” Kareklas said. “While the academic literature suggests that celebrities will, in most cases, only be suitable spokespeople for brands within their area of expertise (this is known as the "match-up hypothesis"), Oprah is a trend maker with a huge and passionate following and can thus bring substantial value to any brand." Kraft Heinz is currently the third largest food and beverage company in North America. The company has a dual headquarters in Pittsburgh and Chicago.